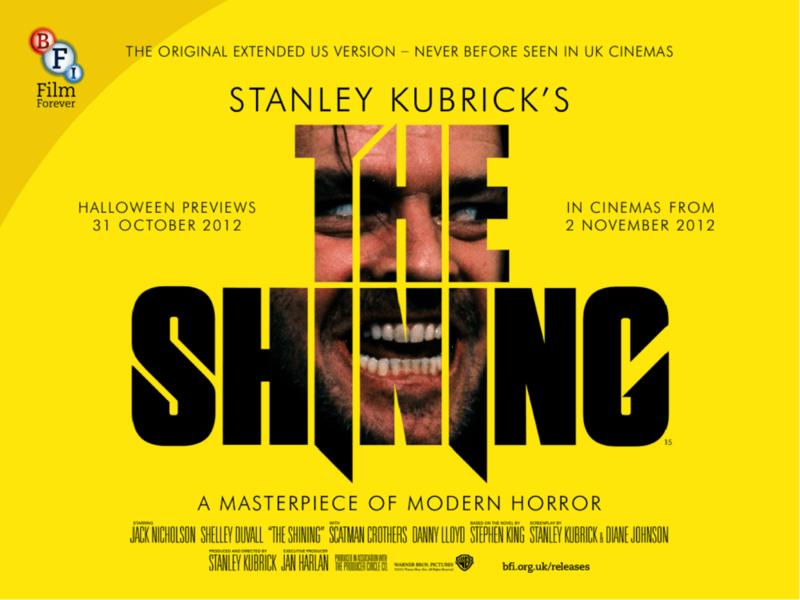 Stanley Kubrick‘s 1980 classic adaptation of Stephen King’s horror novel, The Shining is getting a special re-release over the Halloween season by the BFI to co-inside with the release of a fan made documentary entitled, Room 237 which explores the films theories and hidden messages; Complete with an extra 25 minutes of deleted scenes never before seen in any British or European cinema, it’s certainly a welcomed treat for fans of the film and indeed lifelong horror followers. Delving into the film’s meanings and clues is always a fun and plausible approach, but as a stand alone piece of cinema, it has a profound and lasting effect on many audiences. Set in the isolated Overlook Hotel with his wife and son, writer Jack Torrance (played by Jack Nicholson) takes the job of caretaker during the winter off-season. As his son discovers a psychic ability to interact with inhabiting ghosts and spirits, Jack’s mind slowly falls victim to the unnatural forces present at the hotel, resulting in him becoming an enraged psychopath, set on murder. With Jack Nicholson in the height of his career and Kubrick already having done 2001 and A Clockwork Orange, The Shining wasn’t well-regarded on its first release, being one of only few of Kubrick’s works to not even receive an Oscar nomination, or earn Stephen King‘s critical approval. But overtime, the film has grown to become a classic and showcase that there may actually be more deeper, darker and more sinister workings in the film’s narrative than you first thought. Many conventional horror movies provide you with the blood, the screams and the frights designed to make you jump out of your skin, but the real master stroke The Shining has is its ability to purely haunt and affect your own mental state. Just as Jack dives into a world of mental instability, Kubrick’s tools of vision, direction and sound weave their way into the deep part of the audiences psyche and create an ever lasting dark, looming atmosphere that’s near inescapable. Whether it be the cascading waves of a blood soaked corridor, typewriters consisting of pages and pages of repeatable words, or the sudden shifts from sweet to scary in Nicholson’s performance, the film plays with your mind in the most disturbing but brilliant ways. And for that haunting sense of chills, unease and that sense of allowing a work of cinema into the very depths of your subconscious thinking, staying there, and playing with it, will always be the film’s lasting appeal. It evidently shows that you don’t always need a masked killer or a monster to unsettle the nerves, the ill atmosphere of isolation and uncontrollable breakdown is just as scary to any viewer. Just the very mention of the word “Shining” has the ability to make any of its viewers shiver. It should be considered as the very high point in haunting horror stories and should always be mentioned when discussing Kubrick’s greatest works. It’s fantastic that a new generation of horror fans will have the chance to experience it up on the big screen for the first time. Clearly the film has remained one of audience’s favourite spine chilling scares, and will have a lasting appeal for every horror enthusiast.